This repair parts list is for reference only. Spare parts for Swiss made Etalon indicating micrometers (dial micrometers, super mikes) with .0001", .00005", 0.001 mm and 0.002 mm dial graduations. For information and specifications on new Etalon micrometers, refer to page 16. Long Island Indicator Service offers professional repair service, anvil lapping and warranty repair service for all Etalon micrometers. If you would like us to take a look and give a free estimate, please refer to page 30 for details. We only make a few user-replaceable Etalon parts available, as shown in the listing below. 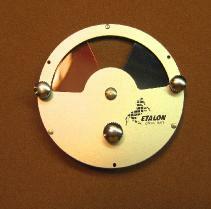 The very oldest lock for Etalon dial micrometers was made in the 1950's. They are metal and have an eccentric cam lock. These are no longer available. The older model Etalon indicating micrometers (1960-1990) have plastic spindle locks which wear out rather quickly from over-tightening. These are no longer available. But there are metal replacements. You can buy this lock and install it yourself. Fortunately the newest and most recent models have an improved metal locking device. This won't retrofit to your older model, however. The new diameters are different. Left: #017857 new style lock (OD = .315") for new model micrometers only. Right: #037905 replaces the old plastic lock - notice the rim which is 9 mm in diameter - this is often a very tight fit* and may need customization. How to replace: unscrew the spindle completely. The old lock usually pulls out easily. After you've removed the old spindle lock, look for a step (counter bore) measuring .406" x .090" in the micrometer body. The presence of this counter bore indicates that this is a new style lock. Insert the new lock and check to see that the inside of the barrel is clear so that you can screw the spindle back in. Don't force anything. And remember: hand tighten only. That's all there is to it. *If you're trying to install #037905 you may notice that it won't fit. The lock diameter is over-sized and may have to be stoned slightly or turned down. You might be tempted to open the hole on the micrometer instead but we suggest you don't tamper with the micrometer body. If you attempt to force fit the lock you may ruin everything because you might not be able to line up the opening correctly, and you may not be able to remove the lock! Proceed with utmost caution. Cover assembly (item #47) is an expensive part to replace. The cover assembly is permanently riveted together. It was not designed to be repairable. To replace the colored markers, or the crystal, you would have to break open the assembly and then you're on your own. We mention this by way of warning. If you'd rather have us deal with it, see page 30 for details. There are three washers (#50) on old models which sit underneath the movement assembly. New models have the washers built in. They aren't there for purposes of adjustment. In fact, they provide 3-point contact when the assembly is screwed onto the body frame. This way, the metal does not warp and cause the pinions to jam. In other words, don't forget to install the washers. The complete movement assembly is shown here. It comes with the dial and the hand installed. The .0001" movement is different from the .00005" and you can switch them if you want to convert your Etalon micrometer from one to the other. Remove the cover assembly (don't lose the tiny screws), rotate the dial so that you can have access to the mounting screws, remove and replace. Remember to use appropriately sized screw drivers so that you do not damage anything. Cover assembly 109699 comes with the red and blue segments. These assemblies are not designed to be repaired. You will have to buy the three mounting screws separately, if you need them. Q: We have recently purchased new anvils from you for one of our Etalon indicating micrometers. One side part # SP109082 (109082) came in with something on the surface that does not clean off. When we purchased these we assumed they would be lapped and ready for use. Can you please tell me if these are lapped and how to remove this FOD from the face? Unfortunately, your assumption was incorrect. After installing new carbide anvils, the retractable anvil will have to be lapped. There is no way that these would be parallel upon installation without lapping. The lapping process will also create the flat mirror finish you are expecting. The process is as follows: the spindle is always lapped outside of the micrometer. In other words, it is removed and lapped flat. On spare parts, these ship with faces already lapped by the manufacturer. The retractable anvil on the other hand, is not lapped. It needs to be installed and then must be lapped to match the anvil. When properly lapped the two carbide surfaces will be parallel. Be aware that the surfaces will only be reliably parallel when there is no sideways play in the bushings in which the anvil and spindle ride. Understandably, if there is even a hint of play, the surfaces can not remain parallel. These are tricky situations which should only be entrusted to professional repair shops. A "do-it-yourself" fix is not likely to be successful.